Mermaids have long fascinated us. Humans have always wondered what it would be like to fly high above the clouds or dive deep into the briny seas. With nearly three-quarters of the Earth covered by water, it's little wonder that centuries ago, the oceans were believed to contain many mysterious creatures, including sea serpents and mermaids. Merfolk (mermaids and mermen) are of course only the marine version of the half-human, half-animal legends that have captured human imagination for ages (half-animals on land include werewolves, and half-avian creatures include harpies). C.J.S. Thompson, a former curator at the Royal College of Surgeons of England, notes in his book "The Mystery and Lore of Monsters" that "Traditions concerning creatures half-human and half-fish in form have existed for thousands of years, and the Babylonian deity Era or Oannes, the Fish-god, is represented on seals and in sculpture, as being in this shape over 2,000 years B.C. He is usually depicted as having a bearded head with a crown and a body like a man, but from the waist downwards he has the shape of a fish covered with scales and a tail." Greek mythology contains stories of the god Triton, the merman messenger of the sea, and several modern religions including Hinduism and Candomble (an Afro-Brazilian belief) still worship mermaid goddesses. In secular folklore, mermaids were often associated with bad luck and misfortune, luring errant sailors off course and even onto rocky shoals. 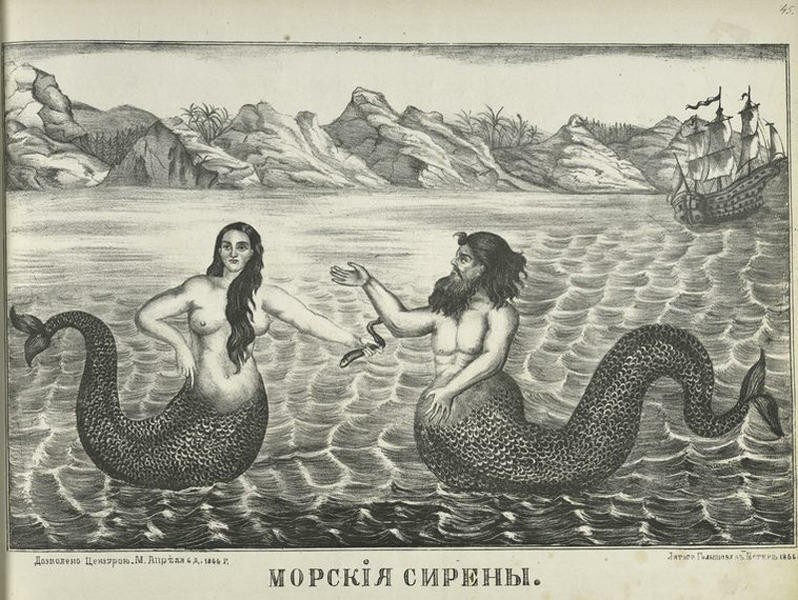 In some legends from Scotland and Wales, however, mermaids befriended — and even married — humans. There are many legends about mermaids, and even a few dozen historical claims of real mermaid sightings. Though mermaid discoveries are sadly rare in modern times, hundreds of years ago sailors and residents in coastal towns told of encountering the sea-maidens. One story dating back to the 1600s claimed that a mermaid had entered Holland through a dike, and was injured in the process. She was taken to a nearby lake and soon nursed back to health. She eventually became a productive citizen, learning to speak Dutch and performing household chores. And — perhaps most importantly for the time — she also became a Roman Catholic. St. John's Harbour, Newfoundland, 1610 from Teodar De Bry's America, 1628. In his Discourse and Discovery of Newfoundland, Richard Whitbourne recounts sighting a strange creature in St.John's harbour which he identifies as a mermaid. Another mermaid encounter once offered as a true story is described in Edward Snow's "Incredible Mysteries and Legends of the Sea." He pictured her as having large eyes, a finely shaped nose that was 'somewhat short,' and well-formed ears' that were rather too long. Smith goes on to say that 'her long green hair imparted to her an original character that was by no means unattractive.'" In fact, Smith was so taken with this lovely woman that he began "to experience the first effects of love" (take that as you will) as he gazed at her before his sudden (and surely profoundly disappointing) realization that she was a fish from the waist down. This account combines common folkloric features of early mermaid reports, including a (presumably sober) respected sailor; a beautiful woman who — like the mythological sirens who tortured brave Ulysses of Greek mythology — is immediately enchanting; and the twist ending of suddenly realizing the truth. 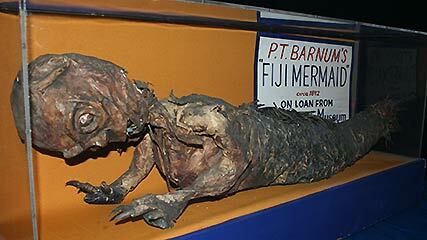 By the 1800s, hoaxers churned out faked mermaids by the dozen to satisfy the public's interest in the creatures. The great showman P.T. Barnum was well aware of the public's interest in mermaids, and in the 1840s displayed the "Feejee Mermaid," which became one of his most popular attractions. Those paying 50 cents hoping to see a long-limbed, fish-tailed beauty comb her hair were surely disappointed; instead they saw a grotesque fake corpse a few feet long. It had the torso, head, and limbs of a monkey and the bottom part of a fish. To modern eyes, it was an obvious fake, but it fooled and intrigued many at the time. Could there be a scientific basis for any of it? Some researchers believe that sightings of human-size ocean animals such as manatees and dugongs might have inspired merfolk legends. These animals have a flat, mermaid-like tail and two flippers that resemble stubby arms. They don't look exactly like a typical mermaid or merman, of course, but many sightings were from quite a distance away, and being mostly submerged in water and waves only parts of their bodies were visible. A glimpse of a head, arm, or tail just before it dives under the waves might have spawned at least some mermaid reports. Modern mermaid reports are very rare, but they do occur; for example, news reports in 2009 claimed that a mermaid had been sighted off the coast of Israel, performing tricks at sunset for onlookers over the course of several months. Unfortunately, the reports vanished almost as quickly as they surfaced (and without further eyewitness sightings or photographs), leading many to suspect an optical illusion of the waves against the setting sun, or even a hoax to drum up tourism. Credit (or blame) Animal Planet (a branch of Discovery), which laired a TV show called "Mermaids: The Body Found." It was a documentary-style show that “paints a wildly convincing picture of the existence of mermaids, what they may look like, and why they’ve stayed hidden…until now,” according to the show’s press Web page. A recent TV movie called "Mermaids: The Body Found" renewed interest in mermaids. It presented the story of scientists finding proof of real mermaids in the oceans. It was fiction but presented in a fake-documentary format that seemed realistic. If the program fooled people, it's because it was intended to; as the show's website noted, the movie "paints a wildly convincing picture of the existence of mermaids, what they may look like, and why they’ve stayed hidden … until now." The show was so convincing that the National Oceanic and Atmospheric Administration, represented in the film, received enough inquiries following the TV special that they issued a statement in late June officially denying the existence of mermaids. Though legends of half-human, half-fish seem archaic, mermaids are not merely dusty relics of bygone days. They are still a vibrant part of our culture and in their images can be found all around us in films, books, Disney movies, and even on Starbucks coffee cups.